California voters just decided to drop the War on Drugs. Proposition 47, which releases drug-war prisoners and downgrades drug possession to a misdemeanor, passed in this week's election. This is a significant reduction in state aggression for California. In my experience, reduction of aggression always corresponds astrologically with the strengthening of Pallas (by the Sun, Mercury, and/or the North Node) by transit and/or progression. This blog reports on many similar events and corresponding transits. 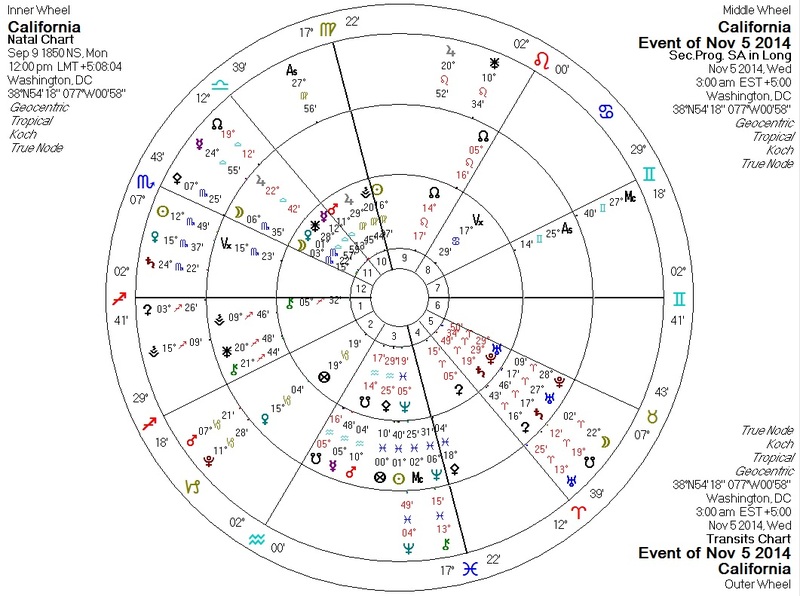 Here's California's chart with transits and progressions for around the time the polls closed. The transiting North Node is quincunx California's progressed Pallas. Transiting Mercury is trine California's natal Pallas. The Sun is trine California's progressed Pallas. This interesting development also makes sense given the California election day transits.